John Lott's Website: Obama administration thinks owning 7 firearms is evidence of terrorist activity. Is this just the Obama administration's effort to make gun ownership difficult and costly? Obama administration thinks owning 7 firearms is evidence of terrorist activity. Is this just the Obama administration's effort to make gun ownership difficult and costly? So owning 7 firearms (4 pistols, 1 shotgun, and 2 rifles) is evidence of terrorist activity? 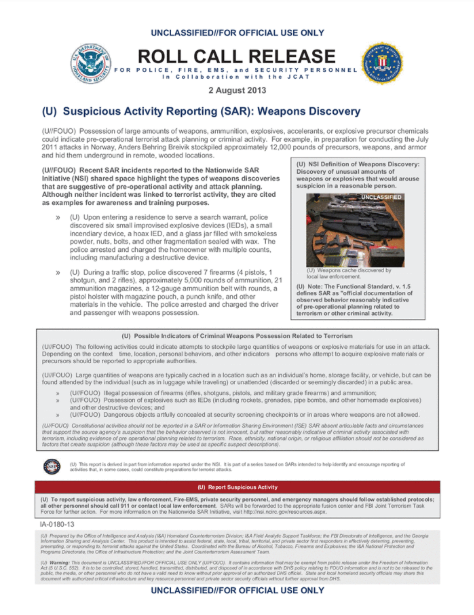 The Department of Homeland Security and the FBI warn state and local law enforcement agencies to look out for people in possession of “large amounts” of weapons and ammunition, describing the discovery of “unusual amounts” of weapons as a potential indicator of criminal or terrorist activity. Is this just the Obama administration's effort to make gun ownership difficult and costly? Markie Marxist sez: "All private gun ownership is terrorism, because private gun ownership is an affront to the authority of the Marxist state. The choice of the number “7” instead of “1” is just an indication of what we Marxists figure we can get away with at this time. The only legitimate gun ownership is collective gun ownership, you know, the police and the military. Every good commie knows that. It's just common communist sense to empower ourselves by disarming private citizens, which is why we need more common sense gun laws, like the New York State SAFE Act, which requires that rifles be registered so that they can be confiscated. We commies would just look foolish if we tried to confiscate rifles without knowing where they were. You wouldn’t want us to look foolish, would you?" This administration also thinks that the American Family Association is a hate group. Pure and unadulterated progressive Marxism at its finest courtesy of the Obama administration. I suppose, if you ignore the party about constitutional if innocent activities not being reported, one could believe this to be true. This really is part of a government required video I just had to view to work private security in a port. I Was thinking , in case you disregard the get together regarding constitutional in case not liable pursuits certainly not being claimed, one could believe this to be true.